‘Battalion’, a film by Dmitriy Meskhiev, won the award for best film at the Mumbai film festival, and three other awards, for best lead female (Mariya Aronova), best script and best editing. Dmitriy Meskhiev’s picture ‘Battalion’ won four prizes at the Mumbai International Film Festival this year, for best film, lead female role (Mariya Aronova), script and editing, reports Lenta.ru. The film narrates the story of the exploits of a woman’s battalion under the command of Mariya Bochkareva. The battalion was formed in Petrograd by order of the Provisional Government in 1917. The film’s author and general producer is Igor Ugolnikov. 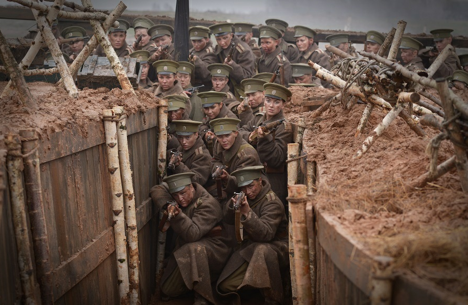 Directed by Meskhiev, ‘Battalion’ was filmed with support from the Russian Ministry of Culture, the Russian Military Historical Society and the Russian Geographical Society. “Once again the world has acknowledged the greatness of Russia’s acting tradition. Mariya Aronova performed brilliantly in this fateful role! In making ‘Battalion’, we hoped that the movie would be understood by viewers from around the world. After all, for all of us, despite language and culture, the idea of women and war is incompatible” said producer Ugolnikov, sharing his impressions of the festival. “Russia has always had a strong interest in Indian culture and, of course, in Indian cinematography. It is therefore particularly nice that the film was so well received at the Mumbai film festival. I will secretly tell you that I really hope that someday I will make a film with my favourite actress, Aishwarya Rai,” MK quoted Ugolnikov as saying. Battalion was released in Russia on 20 February 2015. The film had a budget of $10 million and made $7.5 million in the movie theatres. Before Mumbai, it has won awards at the Russian film festival Vivat, Kino Rossii (Vivat Russian Film) and The Honolulu Film Awards in Honolulu. Ugolnikov was also awarded the gold medal at the ‘Dvoryansky Mir’ (Noble World) film festival for loyalty to military-patriotic subject matters on the Russian silver screen. Based on materials from Lenta.ru and MK.ru.